RIM has announced today that upgrades to some popular apps are on the way and will feature BBM connectivity. 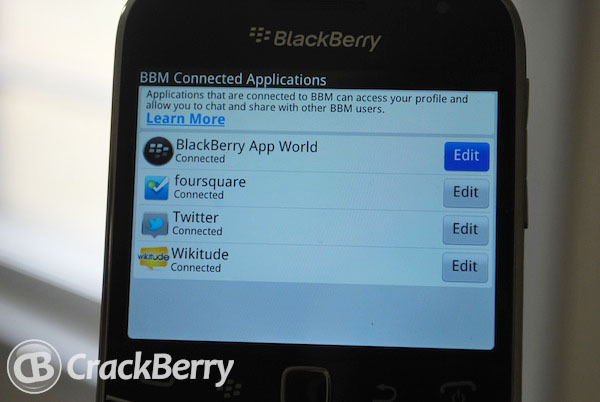 Twitter for BlackBerry, Facebook, BlackBerry Travel, BBM Music, BlackBerry App World and BlackBerry Messenger will all receive updates in the coming days that will add them to the list of BBM connected apps. You can rest assured they will carry some bug fixes and hopefully other various updates as well, and all are due out in the next ten days. WATERLOO, ONTARIO--(Marketwire - April 11, 2012) - A series of updates of popular BlackBerry® apps will be released over the coming days to make it even easier for users to stay connected with their BBMTM (BlackBerry® Messenger) community. Research In Motion (RIM) (NASDAQ:RIMM)(TSX:RIM) today announced that Facebook® for BlackBerry smartphones, Twitter® for BlackBerry smartphones, BlackBerry® TravelTM, BlackBerry App WorldTM and BBM Music will now include BBM connectivity, making it even easier for users to stay in touch with their contacts, share experiences and content, and discover new things from their BBM community. "Since we provided developers the means to build BBM connectivity into their apps, we have seen more than 800 new BBM-connected apps come to market, which has been followed by a huge uptake by users - about one of every five apps being downloaded on BlackBerry App World is a BBM-connected app," said Alec Saunders, VP of Developer Relations at RIM. "Today we're excited to announce that RIM has also integrated BBM connectivity into a number of our own popular apps and the BBM-connected revolution continues to grow." With BBM (version 6.2) and BlackBerry App World (version 3.1.2), users can easily update their BBM profile to let their friends know about the great new app they've just downloaded on BlackBerry App World. With this updated version of BlackBerry App World, users can also instantly share info about their favorite app or a list of their installed apps with friends using BlackBerry® Tag*. With the enhanced BBM Music (version 1.2), discovering music and making friends is easier than ever. New BBM Music friends can be recommended to users right from within the BBM Music app itself, making it easier for users to connect and expand their music collection. The new feature even allows users to sample others' songs before accepting new contacts on BBM Music. In addition to integration with BlackBerry App World, BBM (version 6.2) offers a polished, enhanced and more personal experience. It includes a new selection of animated avatars, a simpler way of updating one's personal message in their profile, and now allows users to quickly send voice notes.